LogixCare™ is our dedicated customer care program for your new FoneLogix cloud-hosted VOIP phone system. The FoneLogix team is committed to providing superior service, assistance and guidance with your equipment for the life of your account. Installing, configuring, maintaining and updating your VOIP phones and PBX are all just a click or phone call away. Clients have peace of mind with a secure and reliable cloud-hosted PBX environment powered over your high-speed business internet bandwidth. LogixCare support and customer care is the backbone of our products, services and solutions. Our staff stands squarely behind you and your communications investment. Below, we provide answers to frequently asked questions (FAQs) to help guide you through common issues and challenges when administering your personalized cloud-hosted VoIP portal features. Additionally, we address everyday tasks and procedures to make your job easy. How do I access another extensions Voice Mail? 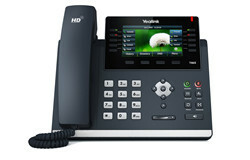 How do I forward calls on a Yealink Phone? There are three types of call forwarding that can be configured on a Yealink phone. “Always forward”, “busy forward”, and “no answer forward”. Always Forward will unconditionally forward all calls made to your phone to the specified telephone number. If your phone is a member of a ring group, your phone will forward the call and bypass the other ring group phones. Busy Forward will conditionally forward all calls to the specified telephone number if the handset is already on a phone call. No Answer Forward will conditionally forward all calls to the specified telephone number if an incoming call is not answered in a specified amount of time. Follow link below to download detailed instructions. How do I forward a call to Voice Mail? You can forward an inbound call directly to another extension’s voice mail. How do I forward a call to my Cell Phone? How do I access Voice Mail? Dial * + <your extension>, *101, for example, to reach voicemail. You may also press the “VM” or “Message” button on your phone, (It has an envelope icon). NOTE: The first time you access voicemail, you will be prompted to change the password. You may not use your extension as the password. Select link below for info on Main Menu and Mailbox Options. How do I block phone numbers? Select New Call Block, add the phone number, the direction of the block and a short optional comment. All blocked calls will ring as busy. How do I set up time frames? Time Frame settings are applied by configuring a Time Frame, then routing a phone number, extension or any other feature to that has a Time Frame setting. For example, if you wanted calls to your phone number to ring an auto attendant during business hours, but go to a mailbox after hours, you would first create the Time Frame setting. For the During Hours option, select the auto attendant. For the After Hours setting, select the mailbox. Then go to the settings for the phone number, and select Time Frame as the option for the Route To: field. Time Frame Name – A short name given to each Time Frame setting, just for something to refer to the setting by within the system. During hours forward call – Select how youd like incoming calls to be routed during normal hours. After hours forward call – Select how you would like incoming calls to be routed after normal hours. For each day that you would like timed settings to take effect, check the check box in the first column, then select the start of the business day in the Before field and end of the business day in the After field. If the entire day is to be considered after hours, then check the All Day check box along with the Day checkbox. The names in the Company Directory are taken from the name as listed in the Mailbox entry. The spoken name is taken from the voicemail greeting setup for that particular extension. How do I configure holiday settings? To define a new holiday click on New Holiday. Name – Enter a name for the holiday. Date – Select the date for the holiday. To route calls differently for the holiday(s) you have added click on Phone Numbers. Edit the phone number(s) you wish to have the holiday routing configured for. Under call routing edit the If Holiday field to reflect what you would like to happen only on Holidays. How do I send and receive with Hosted Faxing? An email address must be defined when the hosted fax service is set up. This email address will receive inbound faxes and will be allowed to send. You can send a fax from any pc capable of sending email, but MUST be sent from the email account(s) DEFINED AS ELIGIBLE SENDING ACCOUNTS. You can define up tp two of these. The document to be faxed is attached to an email and sent to the fax server. The fax system requires that the document be in a PDF format. The system does not attach a cover sheet when the fax is sent so you must include one with your document if you want one. It must be attached as a PDF file. Multiple PDF files can be attached. 20MB total. 250 pages max. They will be processed in order from first to last. An email subject is not required and will be ignored by the system. The body of the email is also ignored. They are not saved on the server. How do I install Wi-Fi Dongle? Disconnect the data cable from the internet port on the back of the phone. Insert the dongle into the usb port on the top back of phone. You will see the message “Scanning…..” and will be presented with some information. Depending on your wireless device you may be prompted to enter your Wi-Fi password. Use the number pad on the phone to enter your password. By default the number pad will enter numbers. To change to letters, select the 123 key and the option will change to abc. You can now enter letters for your password. To enter the letter “a” press the #2 key once. To enter the letter “c” press the #2 key three times, etc. For a space, press the 0 key. (Flashback to texting on your flip phone). After entering the password correctly you should be prompted you have been connected to your Wi-Fi. (It shouldn’t take more than 2 or 3 tries to get it right). You may have to reboot your phone by disconnecting the power cord and reconnecting it. You must have a power cable connected to your phone to use the Wi-Fi dongle. If you were getting power to your phone through the data cable, you must add a power adapter to supply power. You WILL experience problems if you have both the Wi-Fi dongle and data cable connected to your phone. A VoIP phone is a specially-configured phone that places and receives calls over the Internet instead of over traditional analog phone lines. When used as a call center VoIP solution, the PBX-integrated phone features of a VoIP phone can increase employee efficiency and help project a professional image. 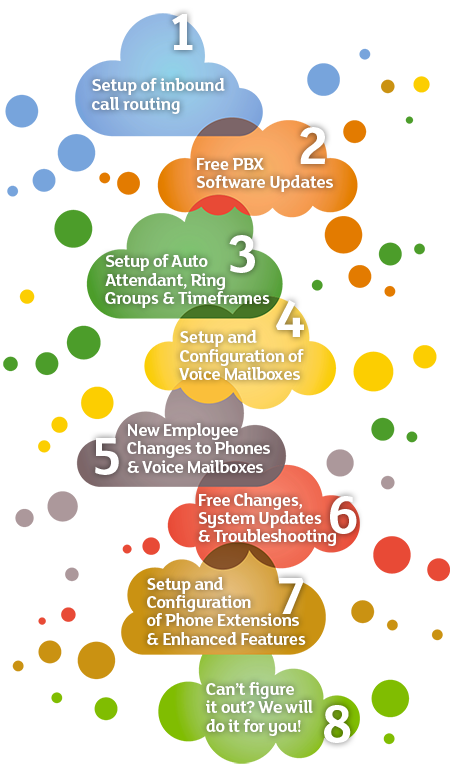 These features can include call transfer, conferencing, call hold, and much more. What is a VoIP PBX? VoIP PBX is a special class of phone system that uses Voice over IP service to place and receive calls using the Internet. This service is frequently hosted from remote by the 3rd party VoIP provider, in which case it may also be referred to as a Hosted Phone System. Is my Internet connection ready for VoIP? Business VoIP solutions in an office setting typically require a broadband Internet connection (T1, Cable, etc.) in order to ensure professional call quality. Internet connections such as dial-up or low end DSL connections can cause problems when experiencing high call traffic. As part of our free consultation, Fonelogix can perform a simple speed test diagnostic to determine your VoIP capacity. In the event that you temporarily lose your Internet connection, you will be unable to receive or place calls using your VoIP phones. Your calls will instead go to your voicemail. If desired, you may contact a Fonelogix technical support representative to have your calls re-routed until your Internet connection can be restored. Can I keep my existing business numbers? Yes. Whether you wish to transfer local area or toll free numbers, we can provide you with the simple forms necessary to have your existing carrier release these numbers to us so that we may apply them to your Fonelogix VoIP service. This transfer can take up to 30 days to process and is subject to the terms and conditions you have with your existing carrier. Can Fonelogix save me money right away? Fonelogix cloud telephone service is specially designed to start saving you money from your initial investment. Since we host the servers that manage your VoIP PBX, the only equipment you need to purchase to get started are the VoIP phones. These phones connect directly to your existing broadband connection and provide a dial tone within minutes. Can Fonelogix save me money down the road? As a hosted VoIP solution, Fonelogix carries many cost savings benefits to reduce the total cost of operation (TCO) of your office phone system. In the short term, you will save on your monthly phone bills with free local and long distance domestic calling. In the long term, a hosted VoIP PBX saves you money on call switching equipment that could become obsolete, or need to be replaced due to hardware failure. Can Fonelogix grow with my business? Fonelogix is a fully-scalable business VoIP solution. This means that you can add lines and VoIP phones at any time without penalty. Whether you’re a booming entrepreneur or a steadily-growing enterprise, Fonelogix gives you the flexibility to ensure that you’re only ever paying for what you need. We are also constantly adding cutting-edge features, keeping you ahead of the curve with the latest phone system technology. Can Fonelogix tailor a phone system to my business needs? Our experienced team of certified networking specialists has a proven track record of delivering highly customized telecommunications solutions. If you have a specialized request for your system, we will examine your situation and provide you with a suitable solution and an implementation timeline. Can Fonelogix link my business’s remote locations? One of the advantages of a hosted VoIP solution is that it can easily link together your remote or home offices as though they were in the same building. By switching calls through the Internet instead of physical phone wiring, Fonelogix users can seamlessly receive forwarded calls, transfer callers to another extension, conference in another user, and much more, even if your offices are separated by thousands of miles. An auto attendant is a pre-recorded professional greeting that welcomes your callers and directs them to the appropriate extension on your Fonelogix phone system. With Fonelogix service, your auto attendant greeting is fully customizable. You may make new recordings at any time over the phone, or upload a new greeting through your Web Control Panel. e911, or enhanced 911, is a telecommunications system that pairs a phone number with a physical address for the purpose of directing emergency dispatch calls to the nearest Public Safety Answering Point (PSAP). Since VoIP phones and phone numbers are not tied to a physical address, VoIP solutions require that users register and update the location of each phone. Fonelogix handles this for you. 3848 Mt. Paran Church Rd. Interested in switching to FoneLogix? Call 678-785-FONE to learn more about our cloud solutions and support plans. We’ll install your new cloud-hosted solution with ZERO downtime, so you can get back to business. Copyright © 2019 FoneLogix® - All Rights Reserved.